Trio of transfers for Blackpool boss Bowyer? Blackpool could still add another three new faces before the transfer window shuts next month. 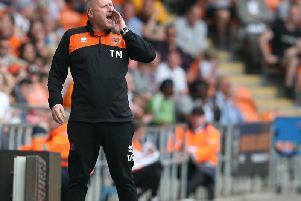 That’s according to Pool assistant manager Terry McPhillips, who suggested the Seasiders’ summer recruitment is far from done. The club have brought in 12 new recruits so far this summer, as well as sealing the return of Armand Gnanduillet. However, manager Gary Bowyer has made it clear he would like to strengthen his options in attack. Pool have until August 9 to bring in permanent signings, although the window for loan signings doesn’t close until August 31. “I’d like to think we can get another three,” McPhillips told The Gazette. “What I do know about the lads we’ve already brought in is that we’ve certainly recruited some good characters. McPhillips was speaking after Pool’s 1-1 draw at AFC Fylde on Tuesday, a game where Nathan Delfouneso rescued the Seasiders with a last-minute equaliser at Mill Farm. The Seasiders, who complete their pre-season preparations with a trip to Crewe Alexandra on Saturday, appeared leggy against the Coasters, but McPhillips is confident they will be ready for the first game of the season at Wycombe Wanderers on August 4. “I thought the effort in the second half at Fylde to get the equaliser shone through,” McPhillips added. “We were desperate not to lose and I thought it would be a travesty if we did for their efforts. “I thought we were in good nick but I thought you could tell there were a few lads who were a bit short, who’ve not played as much for one reason or another. “But they’ve worked their socks off. We’ve been here, there and everywhere doing different bits and bobs. “But in general, I’m really pleased with how they are physically. But don’t get me wrong, in the first half we were leggy. “But that’s pre-season, you get those leggy games. I’d like to think on Saturday we will do better against Crewe and play better. But it’s all geared to Wycombe. “It’s all different tasks. We played Port Vale last Saturday and they had a strong centre forward who causes problems in the lower leagues and he did that against us too. “That’s good to gear around what Wycombe do. “Then at Fylde, to play a local derby to get those minutes under the belt and for different players to get 90 minutes is good. “We go to Crewe and we know we will have to do better against them because they’re a footballing team.